Our world right now is in urgent need of the strong, loving presence and guidance of the Sacred Feminine. The Great Mother reminds us that a brighter future is indeed possible—even in these troubled times. Isabella Price’s masterfully written and comprehensive Goddess Power: Awakening the Wisdom of the Divine Feminine in Your Life takes you on an empowering journey into the heart of the Goddess traditions, introducing the rich history and wisdom teachings of the Divine Feminine /Goddess in her numerous manifestations. 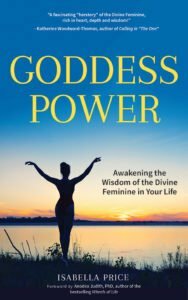 Goddess Power explores symbols, stories, and key themes, as well as offers valuable spiritual insights on the role the Goddess plays in people’s lives today.